Many hundreds of local ratepayers and citizens shouted their opposition to forced amalgamations at a rally in Martin Place on Wednesday where the Baird Government was accused of being gutless ratbags and liars. 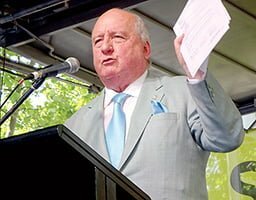 The rally heard speakers – that included broadcaster Alan Jones – condemn Premier Mike Baird’s Fit For The Future regime which threatens to abolish Hunters Hill, Lane Cove and Ryde councils and replace them with a mega Northern Sydney Council that would stretch from Parramatta to North Sydney. It coincided with the last day of the Baird ultimatum to councils to submit their merger preferences (in fifty words or less) and our three local councils are united in their refusal to submit any preferences at all. Alan Jones described the Baird Government’s bullying as shameful. “Local Government Minister Paul Toole said there would be no forced amalgamations, however he is now bullying councils to do the thing he said would never happen,” he said. “This is a day when democracy is on the rack and people do not take kindly to politicians who tell lies. 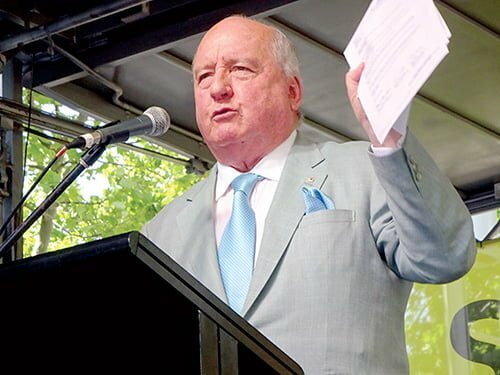 Alan Jones also slammed the recent IPART inquiry that labelled our three local councils as unfit for the future on the grounds of size and capacity, despite their financial position being sound. “It is clear the Government of New South Wales is lying to the people of New South Wales and there are some gutless politicians hiding behind IPART, which has no experience in local government whatsoever,” he said. Local Government President Keith Rhoades said the government’s economic argument of saving ratepayers money through mergers is flawed. “Baird says local councils are losing millions of dollars a day,” Mr Rhoades said. Speakers also blasted the Baird Government’s ‘arrogance’ for not acting on the recent NSW Legislative Council Inquiry findings against forced amalgamations. The Legislative Council was also forthright in its praise for the Joint Regional Authority model, devised by our three local councils, that preserves their existence and elects representatives to discuss shared services. Legislative Council leaders the Rev Fred Nile (Christian Democrats) David Shoebridge (The Greens), Robert Borzak (Shooters and Fishers) and Labor’s Peter Primrose addressed the rally as part of a rare united front. “They say you (councils) are unfit for the future and that is a lie,” Rev Nile told the rally. “This is about our city, our councils and our choice. David Shoebridge MLC said there will be a backlash against Mike Baird at the next election. “We’ll clean out the ratbags,” he said. Unions NSW boss Mark Lennon said this is a fight for democracy, but stopped short of threatening strike action. “Every person has a right to the council they want, not one imposed on them and Mike Baird has no right to rob people of democracy,” he said. The rally was attended by councillors and staff from Hunters Hill and Ryde led by Mayors Richard Quinn and Jerome Laxale as well as by a contingent from Lane Cove led by Mayor Deborah Hutchens. It was also addressed by Aboriginal people who are furious they have not been consulted by the Baird Government, despite the same government recognising them as the traditional owners and custodians of the land. A number of posters at the rally likened Mike Baird’s actions to those of Nazi dictator Adolf Hitler who replaced Germany’s local governments with large ‘Reichsgau’ areas administer by Nazi Party henchmen called ‘gaulieters’. Hunters Hill may lose its community festivals and its friendship agreement with the Parisian town of Le Vesinet if it is merged into a mega North Sydney council, Mayor Richard Quinn warned this week. In an exclusive interview with The Weekly Times, Mayor Quinn said the lost Council funded events include the annual Moocooboola Festival, alongside a swag of other hugely popular arts and cultural activities. “Moocooboola would have to be renegotiated on a mega council, which would not have an elected representative for Hunters Hill on it,” he said. “Our Le Vesinet Friendship Agreement would also have to be renegotiated and this throws the whole thing into question, because this is an Agreement between two places of roughly the same size with many things in common. “If our French connection is not respected, it will be lost and forgotten. Hunters Hill’s renowned services for the aged community would also need be reviewed on a mega council and these often frail residents may face a ‘wait in a queue with your ticket’ scenario in a mega council office located somewhere between North Sydney and Parramatta. “Will we lose the personal touch and will it be just a person behind a desk?” the Mayor asked. Hunters Hill only has two parking rangers and these rangers concentrate on safety black spots identified by years of local experience and in consultation with councillors and residents. There is no guarantee a mega council will not bring in a significantly larger force of rangers, motivated by revenue raising. Mayor Quinn has been a prominent opponent of the mega councils currently in vogue with the Baird Government and believes the government has failed to consider the local ‘connectedness’ that makes a community a community. “Hunters Hill has Sydney’s highest per cent of volunteers because you only get people to engage in their community if they have a sense of belonging to their community,” he said. 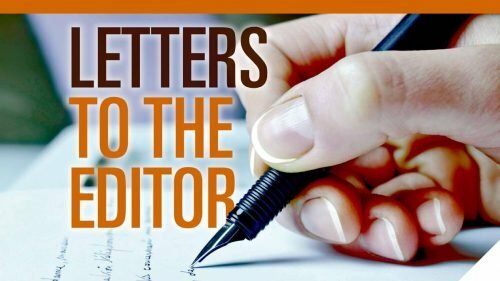 “On a mega council a small community loses its heart and its spirit and it also loses councillors and staff who are genuine servants of the people and who go out of their way to help our community. He also believes the government has failed to respect the traditional close relationship between the Mayor of Hunters Hill and the local community which dates back 150 years to a time when the historic municipality was known as ‘The French Village’. “Mayors here have always been closely involved in our rites of identity and my diary is taken up each day with invitations to local events,” he said. Mayor Quinn has frequently travelled to Europe where he has been struck by the trend to scale down local government, especially in the United Kingdom where villages – called parishes – are vibrant, active and effective forums of local democracy. “A recent trip there made me realise they still strongly hold on to their local identity, while here the government is about to blow all that out of the water,” he said. The Mayor reflects a longstanding view in Hunters Hill that the community’s heritage, both cultural and architectural, has been passed on in stewardship by past generations to be passed onto future ones. An interview with Richard Quinn also conveys a sense that he is also speaking for past Mayors and past generations, while his job at St Joey’s College only serves to reflect his commitment to our future generations. “If we really prize what we’ve got, now’s the time to fight for it,” he said.